On this album we tried to follow the large footsteps of Teo Macero and Miles Davis in taking live improvisations on simple themes and constructing music in the studio using state of the art synthesis and editing. Intriguing, raucous, and spontaneous. 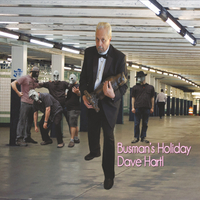 On this, my fifth album, I gave simple thematic material to a live group featuring Philadelphia and NYC music giants Chico Huff (bass), Brian Groder (trumpet), Chris Farr (saxes), and Vic Stevens (drums). We recorded spontaneous jams which were edited and augmented over a long process to produce long, aggressive but dreamlike journeys in sound. All of it is high energy and a sure antidote to Smooth Jazz. Added to the mix on one cut is the screaming Guitarzilla textures of Miles Hartl. All of this was done with the aesthetic of the electric Miles Davis albums of the '70's as a northern star. What to call this music? The Wynton crowd is going to hate it (it's not bop or swing), so it's not "jazz" in the sense that most people think of it. It's electric, fusiony, energetic, but not "rock" either. No lyrics, so people who need words to give the music meaning will feel left out. So... let's call it Sonic Journeys, or a soundtrack for movies in your head. It's really what I've always done, it's just cranked up to the next level. There's structure here, but created and guided by a gut feeling and trust in the moment. The guiding star of Miles and Teo Macero's production shines through in the belief that there's no "wrong" notes, just opportunities to go somewhere you didn't expect. It's how you resolve it. All decisions in post production were influenced by what felt right. If you enjoyed the journeys I took you on in "Lab Work", buckle up, buckaroo. I'm really proud to say I found a way to take it further. This is music of passion and joy, with a good dollop of dark humor. Join me!